A theory that works when assessing discrimination deserves scorn when applied too broadly to activism. 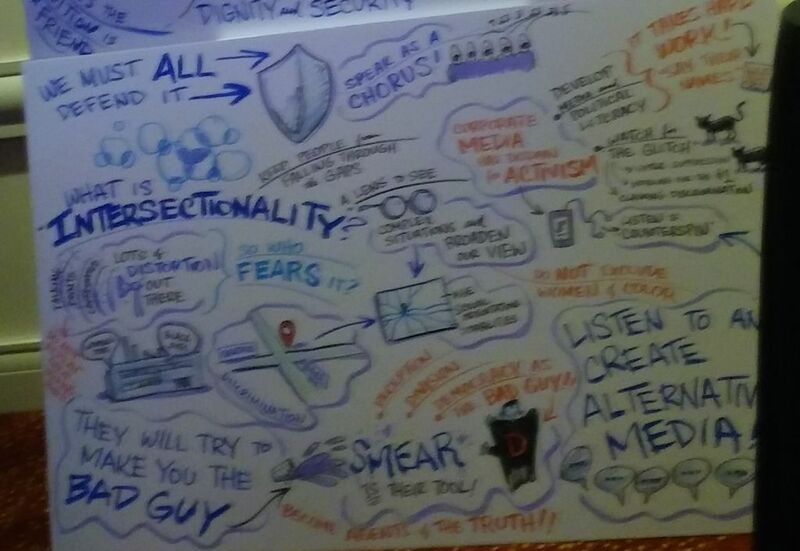 Graphic notes reflect the panel discussion on intersectionality at the Netroots Nation conference Aug. 11. 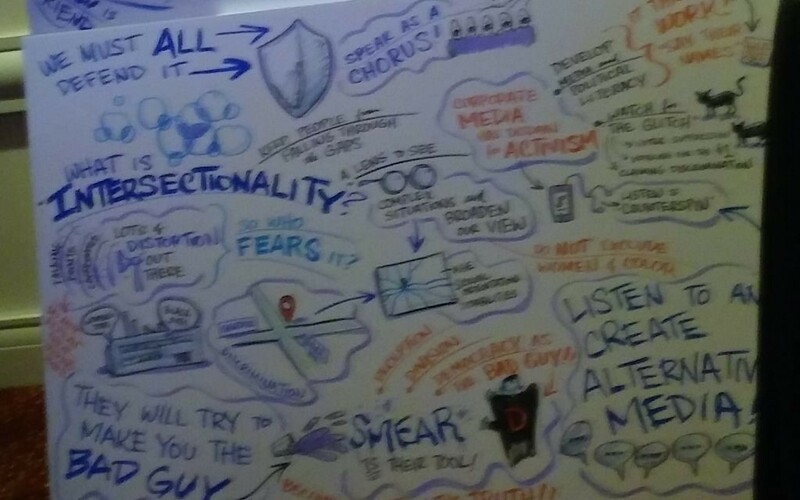 Intersectionality is usually a dirty word in the AJT because of its wide use to attack Israel, but I never knew its origins until the Netroots Nation conference brought together 2,500 progressives in downtown Atlanta the same weekend that the neo-Nazis and Klansmen descended on Charlottesville, Va. The plenary session Friday morning, Aug. 11, featured a panel discussion among Rep. Keith Ellison of Minnesota, who was elected this year to the No. 2 position on the Democratic National Committee; Janine Jackson, the program director of Fairness and Accuracy in Reporting, whose hammering at the “corporate media” is every bit as destructive to American democracy’s vital confidence in freedom of the press as President Donald Trump’s charges of “fake news”; and Kimberle Crenshaw, a scholar of critical race theory who introduced the concept of intersectionality in the 1980s. The discussion was intended to demonstrate how “the right uses smear politics to undermine the progressive agenda,” and Crenshaw joked that she has heard so much criticism of intersectionality in recent years that even she began to doubt its validity. As she described and defended the theory, it makes sense. She said it grew out of a workplace discrimination case involving a General Motors plant where black men got jobs, although they tended to be janitorial, and white women got jobs, although they tended to be secretarial and receptionist. But women couldn’t get hired for the janitorial jobs, and blacks couldn’t get hired for the secretarial jobs, meaning that black women were shut out. The courts, however, found that neither blacks nor women as groups were discriminated, and the law didn’t provide a way to judge discrimination as a combination of factors. Crenshaw more or less rested her defense of intersectionality at that point, having demonstrated its common-sense application to reveal how individuals can be subject to discrimination because of layers of identity factors. Maybe she stopped there because she’s a smart lawyer and knows to stop arguing when she’s ahead, or maybe she recognized that her sympathetic audience just sought reinforcement for the belief in intersectionality. But the criticism of intersectionality, at least in the AJT, doesn’t focus on legal theories of discrimination. Instead, the issue is how intersectionality is used to compel a “one for all, all for one” approach to activism. It’s intersectionality that justifies the Movement for Black Lives, in its effort to counter police violence, improve socioeconomic status and root out discrimination, to devote a few paragraphs in its manifesto to attacking Israel in solidarity with supposed Palestinian allies in oppression — driving away potential supporters in the pro-Israel community for no benefit. It’s intersectionality that supports the myth that U.S.-Israel police exchange programs are all about sharing methods of crushing minority populations — ignoring that better training is one of the ways to reduce the likelihood of bad, violent decisions by officers. It’s intersectionality that produces chants of “From Palestine to Mexico, all the walls have got to go” when groups spontaneously gather at airports to protest efforts to exclude immigrants and refugees — creating a false equivalence between a real barrier that has succeeded in decreasing suicide bombings in Israel and a proposed one that would be no more than an expensive symbol of division and distrust. It’s intersectionality that leads to nonironic cheers when a Palestinian-American declares that it’s impossible to be a feminist and a Zionist because Palestinian women count — overlooking the women repressed and abused in much of the developing world, including most Arab nations. So it’s intersectionality that will continue to be viewed and discussed negatively in this newspaper. Whatever its value in addressing discrimination, the theory turns destructive when it forces people to pass a series of litmus tests, including opposition to Israel, to help right any wrongs.